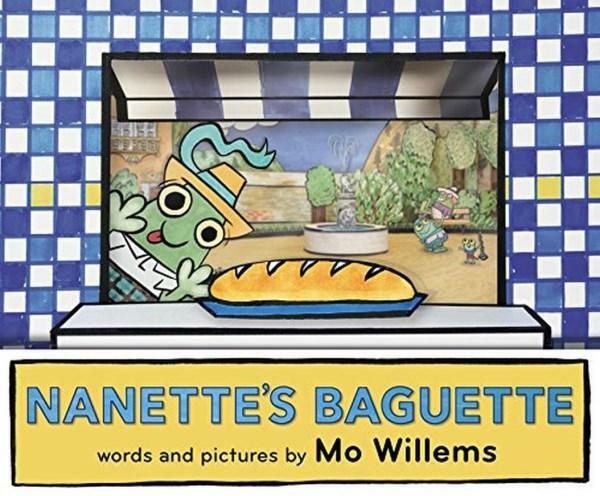 Nanette is a little frog, living in a town where flies are pets, and baguettes are simply irresistible. ‘Today is a day Nanette won’t soon forget … Is Nanette set to get the baguette?’. And so on the story goes, in which Nanette does get the baguette, but is unable to quite make it home with the baguette intact. Will Mum be upset? After a fantastically expressive walk home in the rain, Nanette admits to Mum that she ate the baguette, but Mum’s not upset and they go together to get another baguette. But we soon learn that it is not just Nannette who can’t resist a baguette! In the ever popular Knuffle Bunny series, Mo Willems imposed his full colour cartoon style character on black and white photographs of real world locations, creating a series of illustrations that were captivating, unique and of course extremely funny. 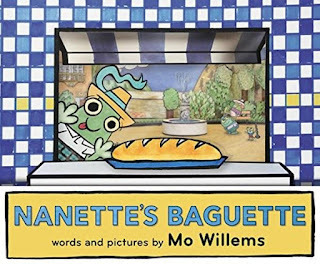 Similarly, Nanette’s Baguette also uses photographed backgrounds, however the photos in these illustrations are actually of a world that Mo Willems has constructed out of cardboard and paper. These incredible constructions all bear Willems’ distinct illustrative style, on everything from the shop fronts to the border around the park, which are rich in detail (keep an eye out for the frog family photos on the wall in Nanette’s house) and bring a different depth and perspective that I am unused to seeing in picture book images. It was a true joy pouring over these artworks.